A lot of gardeners have a desire to grow their own roses, but more than a few are daunted by the task of caring for their roses. Roses sometimes get a bad reputation for being very difficult to care for, and while some varieties require a little more maintenance than others, most roses can be cared for using pretty basic rules that apply to most plants! One of the biggest things you can do in the care of roses to ensure they live a long and healthy life is to give them the proper growing conditions. You are going to want to choose a location that is sunny in your garden. You are looking for a minimum of 4 to 5 hours a day of full sunlight. Anything less than that and your roses will not perform as desired. You also need to be careful not to overcrowd your roses. Give them plenty of space to grow. If you are replacing an old or dead rose bush, make sure you dig out roughly 18 cubic inches of the old soil, replacing it with new soil. Rose bushes often do not like growing in another rose's old soil. 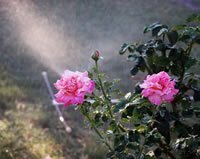 In the care of roses, it is best to water first thing in the morning as this will go a long way towards preventing mildew and black spot. Try to only water the soil and not the leaves of the plant itself when possible, this will help prevent the spread of disease. A weekly "bath" is good however to clear off any dust and insects that might be on the plants. Try to make sure you are giving your roses a good 1 to 2 inches per week of water, especially during dry or windy conditions. Roses planted in containers will need more frequent watering to prevent them from drying out. A great many varieties of roses you come across will tell you that they only need fertilized one time a year. For the most part this rule of thumb will work for most gardeners and most applications of roses. Roses in general will certainly appreciate the occasional extra feeding, as long as you fertilize them at the right times. You can look at fertilizing as you would giving a reward to a pet for doing good. If you are going to fertilize several times a season, you should reduce the amount you give them. The first dose of fertilizer can be given as the rose plant starts to leaf out. After that, you can give your rose plants a small dose of additional fertilizer after each cycle of blooming. Think of it as a reward for a job well done. 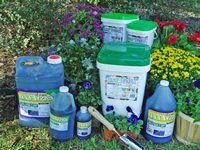 There are plenty of options for fertilizer that you can use in the care of roses. If you are going to use a dry fertilizer, be careful to keep it off the plant foliage and water it well after applying. Stop giving fertilizer roughly 2 months prior to the end of the growing season, or the last frost. Mulching is extremely important, not only in the care of roses, but in most other plants as well. Mulch provides so many valuable benefits to a garden that it is a wonder why some people don’t bother at all. Mulch does far more than just helping to prevent weeds from growing, although it works well for this too. Mulch will help trap moisture around the base of the plant, allowing it to absorb more before it drains away. Mulch also helps in the fight against diseases by forming a precious barrier between your plants and the pathogen laden soil that they grow in. A good layer of mulch will prevent water from splashing on the soil and spreading disease up to the plant above. You should lay down 2 to 4 inches of mulch in early spring just as the temperature begins to warm, but before any weeds start to grow. While most commercial mulches will do just fine, organic mulch is usually the best and you can often find these at most garden centers and nurseries. Pruning is an essential part in caring for roses if you want to get the most out of your plants. A lot of people are nervous about pruning and there is no reason to. There is no recorded evidence of anyone killing a plant by pruning. While pruning does take a little time and experience to learn properly, you can only get that experience by trying. So grab your pruning shears and get into it! Pruning is essential if you want to control the shape and the size of your roses. Pruning a plant properly will actually encourage it to grow bigger and fuller and it can also lead to more blooms. If you selectively prune the top growth of the rose plant, you will find the plant will produce fewer but larger blooms. Climbing and vine roses should be pruned almost immediately after they bloom because they will generally only bloom on the previous year's woody parts. If you are growing hybrid tea, grandifloras, or floribundas roses that are already established, you should prune those in the early spring once the weather breaks and the new buds start to form. Always make your cuts at a 45 degree angle to the stem of the plant.